So tonight is my last night at home before heading back to the trail. It’s a little bit tough to leave home, but I’m excited to get back on the trail. The past four or so days have been amazing. Not only did I get to eat tons of awesome food, but I got to spend time with all of the awesome people in my life. 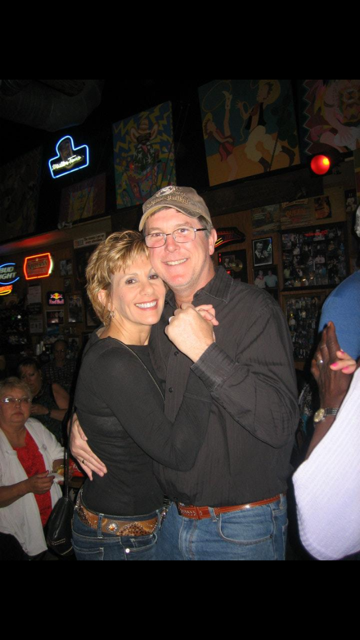 As I mentioned, Friday night was my parent’s 35th anniversary celebration. My friends Megan and Bill also had their first child on Friday – she’s a beaut. And Saturday night was my friends Dan and Natalie’s wedding day. Both were truly special. I want to write more about those events, but I’ll hold off on them for now. You’ll get that post in a few days or so. The 150 miles or so from Damascus to Pearisburg are a little bit of a blur at this point. I was pulling some of the longest days I’ve done thus far on the trip. Most days were around twenty milers, give or take a few miles. It feels good to be hauling out some longer miles, but it does take its toll on you, both mentally and physically. It’s also starting to get much hotter out there, which means I’m much sweatier and much smellier (kind of hard to do). But besides the longer days, a few fun things stand out from my last two weeks or so of hiking. I met some cool people along the way. I’m still trying to hunt Tangy down (one of the reasons I was pulling longer days), but always great to meet new people. Greenland (see picture below), Hotshot, Wash, and Boo Bear were probably the people I hung out with most on this leg of the journey. Greenland wanted a picture of us before I hopped off the trail. I think I’m getting pretty good at taking these self-photos! All my Beard Chronicle photos are selfies, and I am impressing myself with my accuracy! Hopping off the trail for these four days puts me a little behind this new crew of friends, but I should be able to make some hay and catch them up fairly quickly. Hotshot (hilarious name by the way – she’s not as high and mighty as her name makes her sound though) is hopping off the trail for a quick return home in a few days, so I should be able to catch her up fairly easily, although she hauls like crazy. I completed my longest day so far on the trail during this leg – 29 miles. I must say, I was pretty drained at the end of the day. But there is a reason I walked 29 miles in the first place. And yes, the reason is food, specifically pizza! I wish I had taken a picture of this pizza, because it was the hardest I’ve ever worked to get a meal. There’s this shelter that is right next to a park visitor center. And the trail angels at the visitor center are nice enough to put a phone outside along with a big binder of restaurants that will deliver to the visitor center for hikers. Obviously, this is big news for hungry, tired hikers, so everybody knows about this place. I had originally planned on doing only about 18 miles that day, but the call of the pizza was just too strong. I found myself picking up the pace throughout the day as the small thought of pizza in the back of my head eventually consumed all my brain power. I was pretty much a zombie by the end of the day, but the pizza was well worth it. I ate all but two slices for dinner, and the final two made a nice little breakfast in the morning. Yes, disgusting, but disgusting in the most delicious way possible. Pizza Quest 2013 was a grand success. 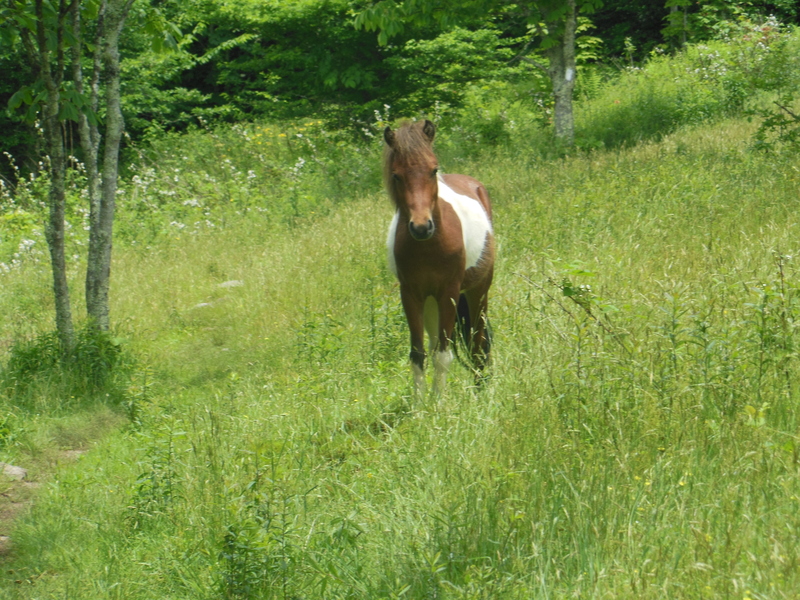 I hiked a day or so in the Grayson Highlands, where there are these “wild” ponies all over the place. I did not have too extensive of a conversation with them since I didn’t see a ton of them. And the ones I did see either ran away from me, or tried to eat me, and I ran away from them. This crazy guy was the first one I saw. Right when he saw me, he walked right up and just started attempting to eat anything on or around my body. It was unreal. I tried to feed him some grass, but he didn’t want that. He just wanted to eat my shirt. At that point, I decided I’d rather keep my shirt and I kind of ran away from him as I kept the rabid beast at bay with my hiking pole. It was all quite amusing, but not what I was expecting from the ponies in the park. Boo Bear encountered the same pony an hour or so prior to me, and it did the same thing to him. He got a great video of it all though as he ran away from the creature. Someone might need to put that horse down, he’s a man eater. It’s late now, just hit midnight. My plan of an early sleep tonight was foiled by my lack of energy earlier in the day. I need to wake up in a few hours to get on the road. My past two days of partying caught up with me today (especially last night at the wedding – things got a little too crazy, but I think I crushed the dance floor), so apologies if this post is somewhat lacking in creativity and overall entertainment value. The civilized life has blunted my mind, so I’m excited to become an unkempt and free thinking hiker once again. As I mentioned, I’ll have another blog post in a few more days. I want to share some thoughts on all the awesome events that happened over the past few days after I’ve given it all a few days to sink in. Check out the plants and animals page and the Beard Chronicles as well. We got another bearded man up on there now – the Steve! Have fun all, I’ll talk to ya soon! Edit/Addition: A couple of things I failed to mention. In Damascus, the day before I left, we partied in some Mexican food restaurant – but the funny thing is is that it was closed. The reason they were closed is because a few brothers own it and they were just hanging out and partying in there. Somehow, Party got us in and we just hung out for a couple hours with these three completely bombed dudes (they went golfing earlier). I’ll give you a quick update while I’m hanging out here in Dalesville. Technically, I haven’t reached Dalesville yet. But I hopped into town (got chauffered into town) by my brother Matt who is going to hike a couple of days with me! We’ll head back to where he picked me up today and begin our hike in the morning. It’s a big morale booster to have Matt here after having a rough past few days. I got back on the trail on Monday the first and hiked about 20 miles in the latter part of the day. Perfectly fine, nice day. I ran into Party, it was nice. 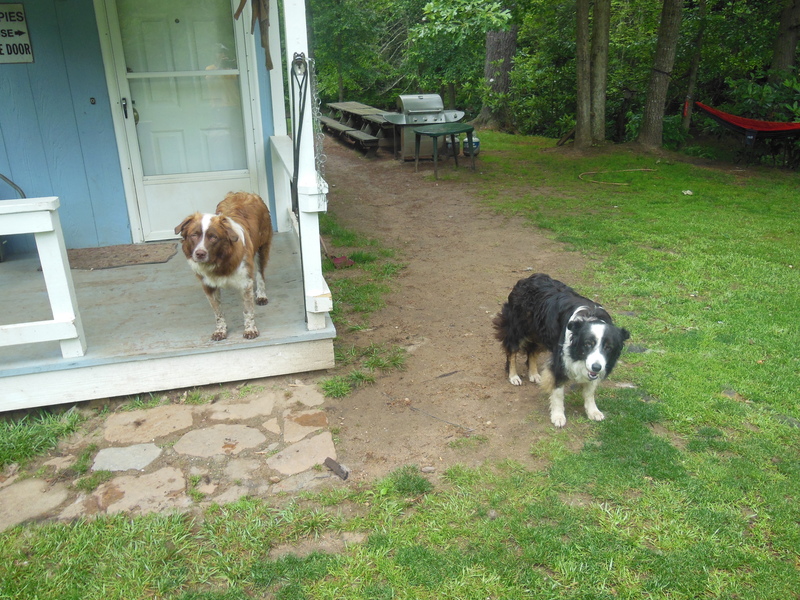 I hung out with Party’s dog (Easy), I camped in the Captain’s backyard (some random dude who lets hikers camp at his house – you take this cool zipline type thing across the creek), I played with the Captain’s dogs (I was playing with tons of dogs on Monday). And then came Tuesday, Wednesday, and Thursday. And they all shared one thing in common – rain. I was either wet, or drenched for the past three days. From a morale standpoint, it starts to take a toll. You just can’t get dry, it’s impossible. There isn’t much to do except grin and bear it, and know that hiking in the cold and wet is a part of this challenge I expected, and will accept with a smile. At least today I got some clean clothes and a hot shower at the hotel we’re staying at. Tonight we will celebrate the 4th with a few beers, recite the constitution to eachother, and know that moral individuals are the foundation of freedom (can I get a ‘here here’). So have fun tonight. Raise a beer to the land we want to live in, and tell the freedom haters to get out of here, because they’re weirdos. So in my very lazy post from the end of my time spent at home, I told you guys I wanted to share some thoughts about the weekend I had at home. So I’ll try not to get too sentimental, although I admit, I have a couple of times before (and will do so in the future – so deal with it as you see fit, preferable by eating tons of mayonaise). People sometimes ask me if it’s “ok” to take time off the trail for the things I’ve taken off for – Celli’s bachelor party, my parent’s anniversary party, Nat and Dan’s wedding, Meg and Bill’s baby [even though I wasn’t there] and in the future, Celli’s wedding). Honestly, I’m not sure if it’s frowned upon or not, but I don’t really care. There are much more important things in life than being able to walk 2,100 miles without taking a break from it. So I’ll gladly compromise my pristine walking record for the priviledge of being included in these celebrations. It is an absolute honor for me to be a part of these things. So to everyone who has let me be a part of their lives, and to everyone who takes the time to read this blog (I can’t believe how many of there you are – you surely must have better things to do! ), I just want to thank you for letting a stooge be part of all of your lives. These events of the past week are only a microcosm of the people I’m talking about. My parent’s party was amazing – Dad, you killed ‘500 miles’. It was awesome to see everyone there, but it was especially awesome to see both of you so happy. You created something great. Dan and Nat – awesome party. I can’t thank you enough for having me, and I blame my antics on the lack of any social structure on the trail. Nat, you looked beautiful, and Dan – you looked somewhat decent, better than I would have thought I guess. Here’s a great article about the wedding, and some pics. Meg and Bill – awesome baby. Can’t wait to see you guys when I get back. I’m going to come live with you for a few days, so just get ready. And I’m obviously inviting John as well. Celli and Megan – I hope I ruin the dance floor at your wedding just as badly as I did at Nat and Dan’s. Everyone – love you all with all my being. Can’t wait for many more years of simply living as part of your lives. 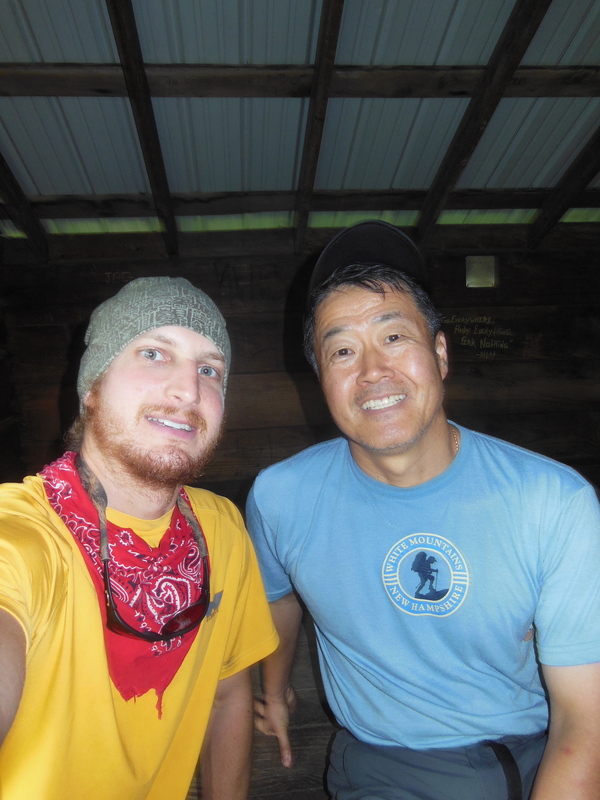 So back in the Roan Mountain area, I hiked with a guy named Rusty. Cool dude, he gave me a bacon and eggs Mountain House meal (my first ever Mountain House – it was amazing). Anyway, about a week ago, I got an email from Rusty. He hilariously found my blog while he was just checking out some Appalachian Trail stuff. 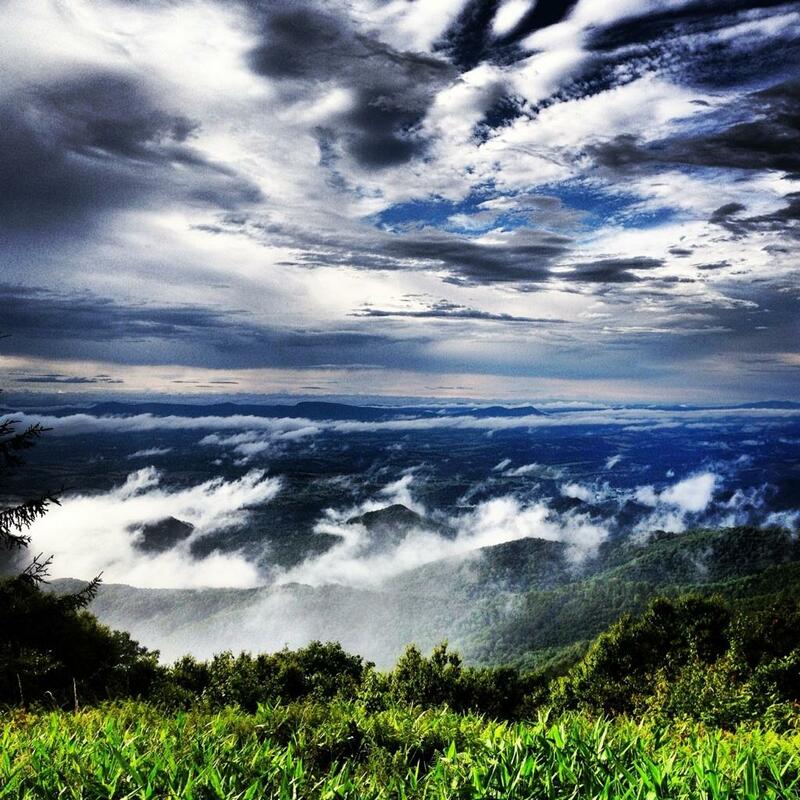 He emailed me this awesome photo that he took. If you take a close look, you’ll actually see me in it. I’m the very small yellow dot in there. This picture is neat because it really shows the scale of the places I’ve been traveling through. 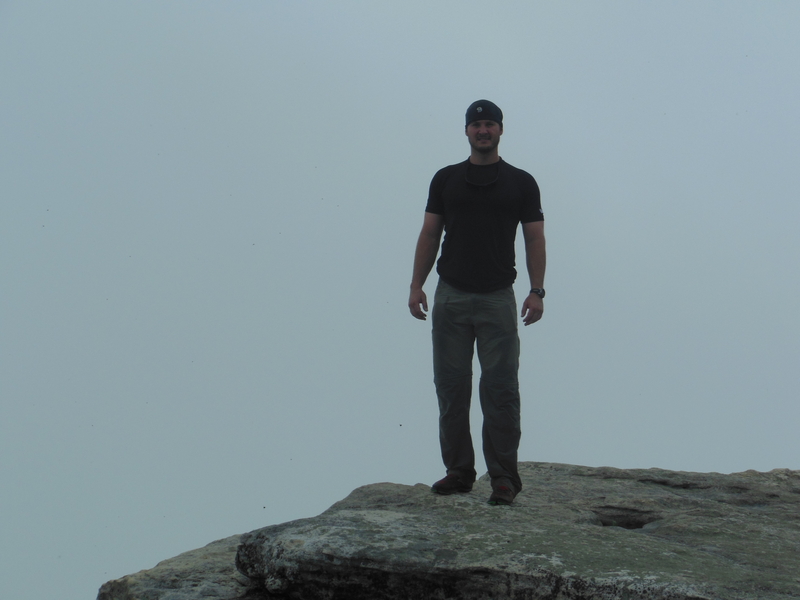 I was talking to some people back home this past week, and I was describing how the AT is more of a mental challenge than anything. Don’t get me wrong, physically it is demanding – but you know your body can do it. It’s just allowing your mind to allow your body to do it that is most difficult. Sometimes you feel so miniscule and small when you walk among this terrain. Sometimes you just spin around and look at it all in awe. Sometimes you spin around and ask yourself what you are doing out here, walking among these giants. But either way, it is what it is, and it’s something very special to behold. Getting back on the trail after a zero day is always tough. But it’s even tougher when you take five or so days off, as was the case with me last weekend. And then it’s even tougher when you get rained on every day. So, needless to say, it was awesome to have Matt come out for a couple of days to hike with me. 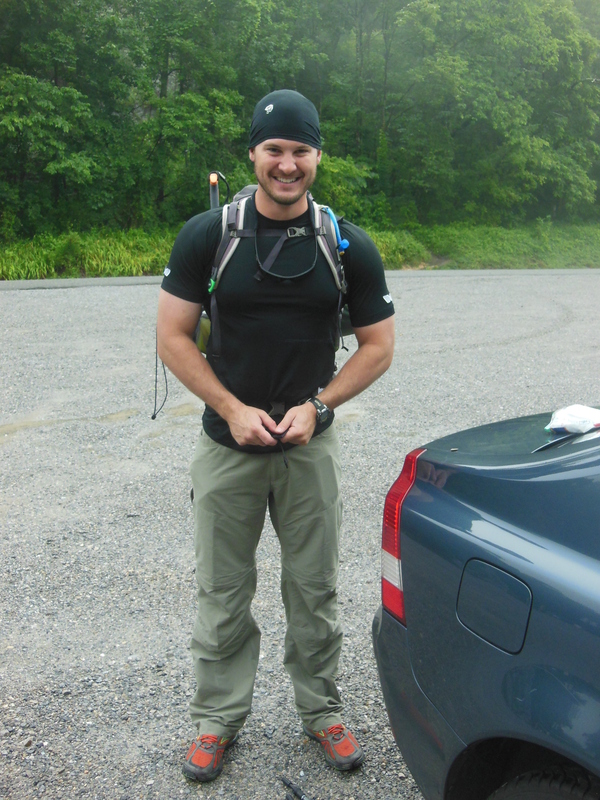 Here is The Googan gearing up before the hike – he’s got a machete. I had my tomahawk. No bears would mess with us. One of my favorite questions. The answer of course was no. But that’s the mindset you have when you pull long days – they’re hard. Luckily we found a pretty awesome camp site about a half mile later and we settled down for a nice firefly spectacle that night. So The Googan finished out his excursion with a few blisters and some soreness, but his mind power intact. We pulled some big time long days, and he gutted through them like a champ. It was a blast having him out there, and a huge morale booster for me. Now Paul is up next! So right now I am at my aunt and uncle’s house on the computer. A very unexpected stop, but a very welcome one. 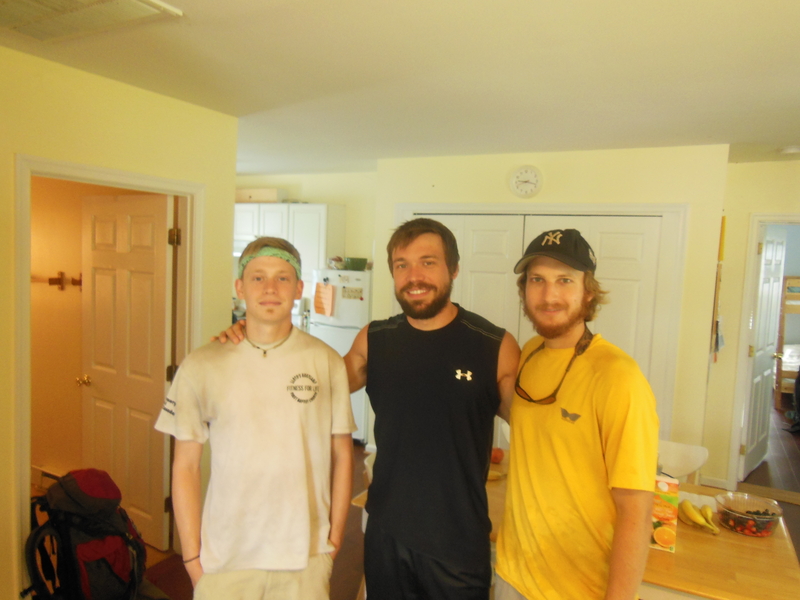 My Uncle Mark and cousin Taylor met me near Rockfish Gap yesterday and we went to a beautiful campground and did some bbq’ing. We had talked about meeting up somewhere along the trail, so it was a nice little break from the trail. Unfortunately, the weather was again pretty terrible. So we were in the cold and rain for most of the day. Then Uncle Mark proposed returning to the Richmond area for the night. After some thought, I figured why not? I could get a good sleep, get out of the rain, and visit some family. So here I sit, getting some blog updating in (I updated plants and animals, Beard Chronicles, and added some pics to some earlier posts – check them out). And it appears the weather may actually be turning for the good. I’ll get back on the trail later this afternoon and pull a later hike into the night. On the way to the house last night, we stopped at REI. A very necessary stop. Just in the past week or so, some of my gear has started to feel the wear and tear. My tent seams are leaking a little bit, so I got some sealant, and then there are my trekking poles. Sadly, I no longer have the same poles I began my journey with. About three days ago, I realized I lost one of the metal tips on a pole, resulting in much slipping and sliding. Not a huge deal, but something I would need to remedy. Then yesterday morning, I awoke only to find what I first thought was foliage on the handles of my trekking poles. However, after closer scrutiny, I realized the “foliage” was the remnants of the wrist straps. Some creature (likely mice) had devoured both wrist straps, nearly in entirety, throughout the night. Might not sound like a big deal, but a lot of your weight is transferred into the straps, so they are very necessary when hiking. So anyway, my trekking poles, in a matter of about 3 days, became a liability. I went into REI and asked a guy if I could get some replacement straps and metal tips. To my surprise, he said no, and told me to instead just return them for a new pair. Honestly, I didn’t really want to do that – I feel like that’s taking advantage of their awesome policy. But he told me no, go ahead and do it – so I did it. 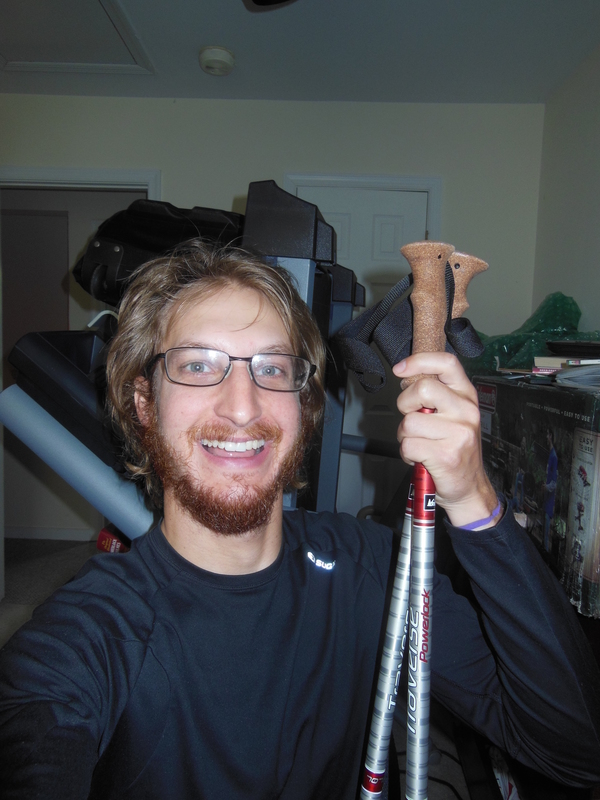 It was kind of crazy, I gave them two delapadated, old trekking poles, and they gave me a pair of perfectly new ones. After being an “owner” of REI for about three or four years, that was the first item I ever returned. So good work REI – you guys did well. The only bad thing is I lost the sentimental value of my old trekking poles. But oh well, I still have over 1,000 miles to put some wear and tear into these new ones! Hoping for better weather in the week or so ahead! Next stop is Luray, Virginia! First off, I’d like to thank my worldwide audience. Yes, I said worldwide. Apparently, I have some big fans in Russia! And a bunch of Spaniards, and even an Egyptian view. Hilarious stuff. I hope you guys are enjoying following an American stooge. Anyway, I thought that was hilarious. Check back again in a few days as I’ll update when I’m in Harper’s Ferry again! The past few days hiking have been pretty good, but long. The previous two days I pulled a 27 and a 25 mile day, so headed into town yesterday, I was pretty beat. 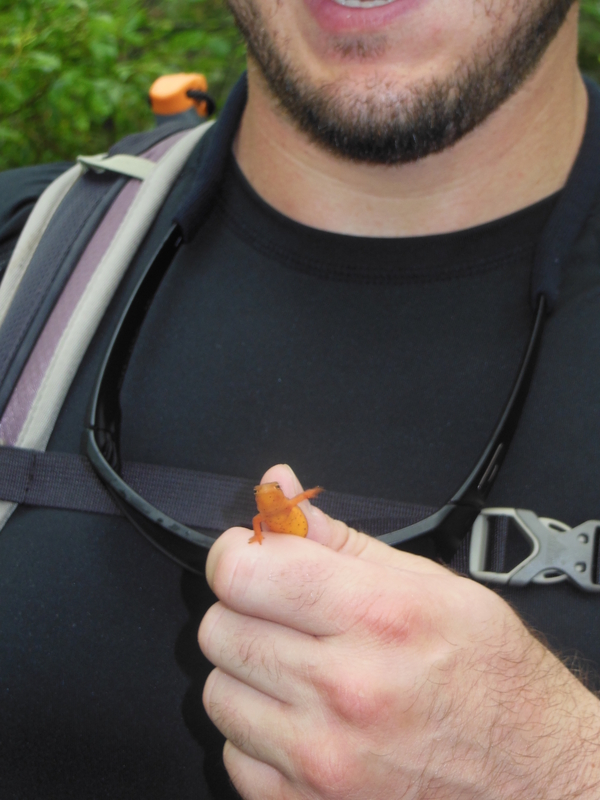 But it was all good, because I had some pretty neat wildlife encounters to lift my spirits. About four days ago, I stayed at the Loft Mountain Campgrounds – a legitimate, RV style campground (I obviously did not pack in an RV, although that would have been awesome). Right before I was going to sleep, I was writing in my journal at my little picnic table. Out of the corner of my eye, I saw a doe and a fawn about 30 yards away, and then in front of me another deer about 20 yards away. Over the next thirty minutes or so, the deer came to within about five yards of me as they were feeding and just hanging out. It was pretty wild. Unfortunately, my camera was in my tent, and I couldn’t move about much for fear of scaring them away. 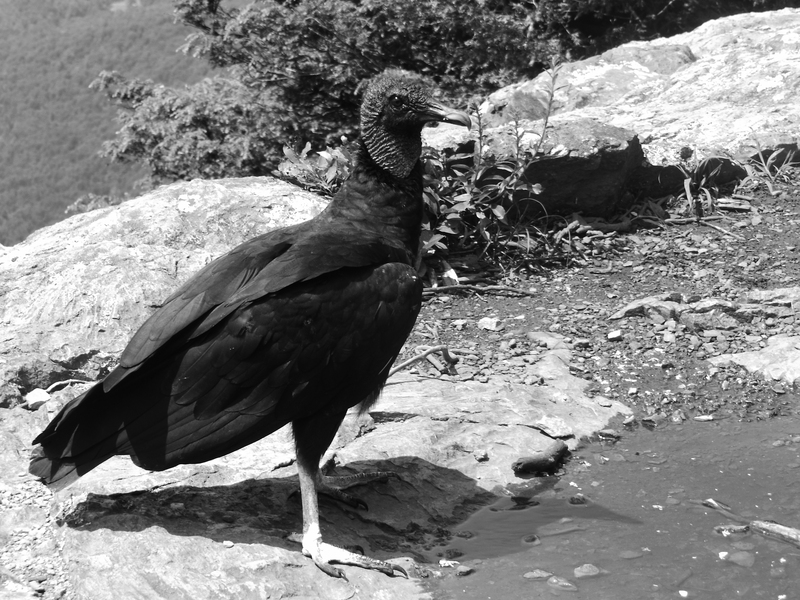 I also came across this pretty cool vulture kind of bird thing up on top of a cliff. Luckily I didn’t scare him away, and I got some pretty neat pictures of him. 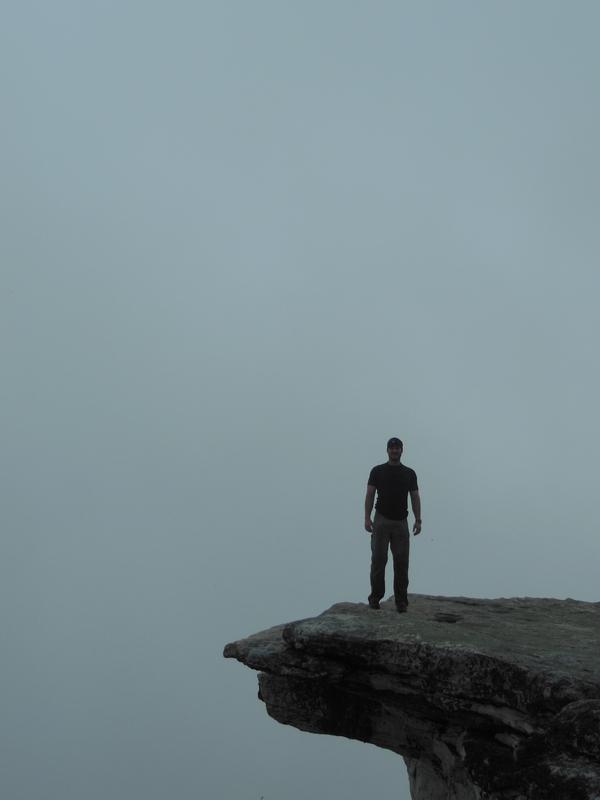 The second one I took a split second before he leaped off the edge of the cliff. It was awesome – he dropped for about two seconds, then I saw him ride an updraft up and out through the valley. 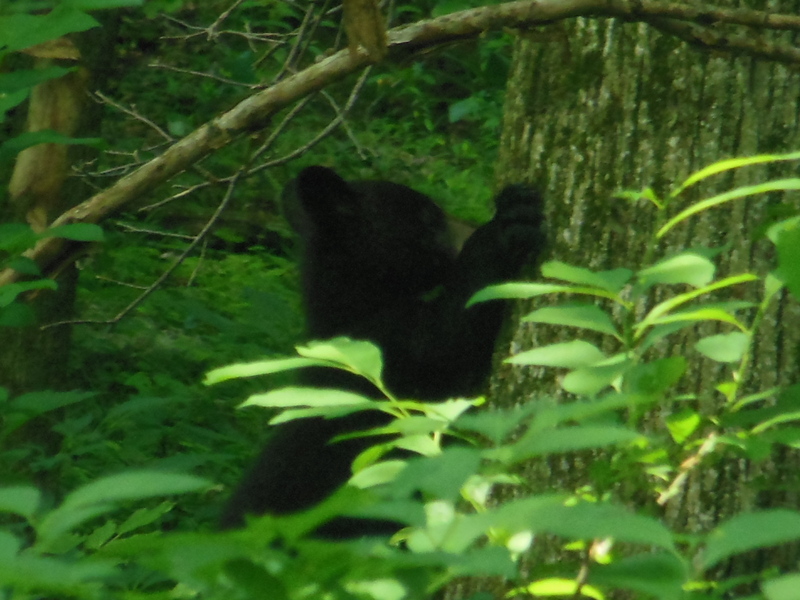 Then, yesterday, about three miles out of town, I had my second bear encounter! Bear sightings have been rampant in the Shenendoah National Park (I’ve been in there for the past five days or so), so it was only a matter of time before I saw one. It wasn’t a great sighting, but it was better than my first. I came upon two dudes hiking who told me they saw two cubs and a bear. So after making some noise and proceeding a bit further, we saw the mama and the two cubs run off the trail and down into the woods. I was about 30 yards from them, so it was a neat sighting. Again, sorry – no pictures! The Shenendoah National Park has been neat though. It’s fairly easy hiking, and they have a bunch of things called Waysides throughout. They’re pretty much roadside burger joints. So there are a good amount of opportunities to stuff your face along the trail. I take advantage. I got scooped up by a kid and his dad who own a landscaping company. They were normal blue collar guys – always the best for getting hitches from. Neat guys, and a fun ride into town even though I struggled understanding a lot of what the dad said. So when I did understand a question, and I answered it without any awkward pauses, I was quite happy. After they threw me out of the window while still going about ten miles per hour, I took my first zero since getting back on the trail on the first of July. So it’s been a long time since I’ve had some relaxing time. 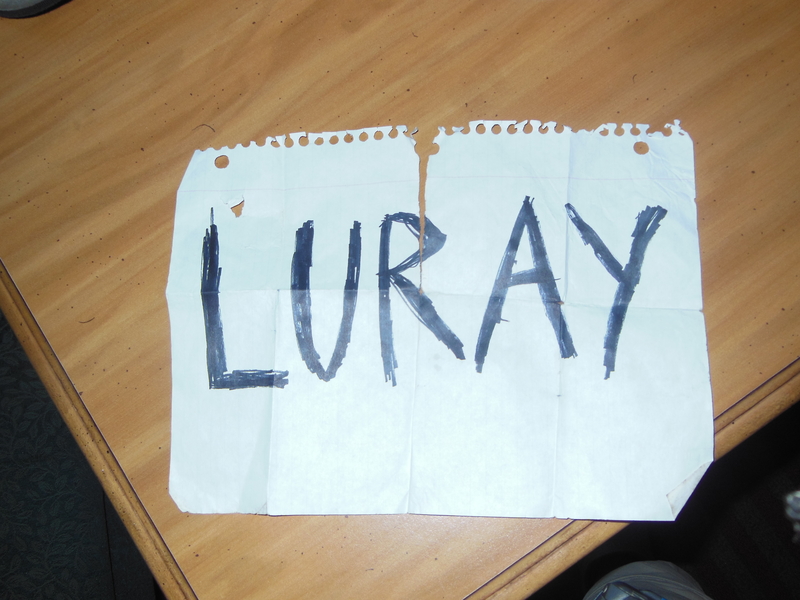 Luray is a pretty neat town – it’s got that quaint old feel to it. I’m staying at a much better hotel than I did in Buena Vista. It’s even got enough room to put up my tent! I had to seal the seams of my tent today. With all the rain last week, I started to spring a few leaks. 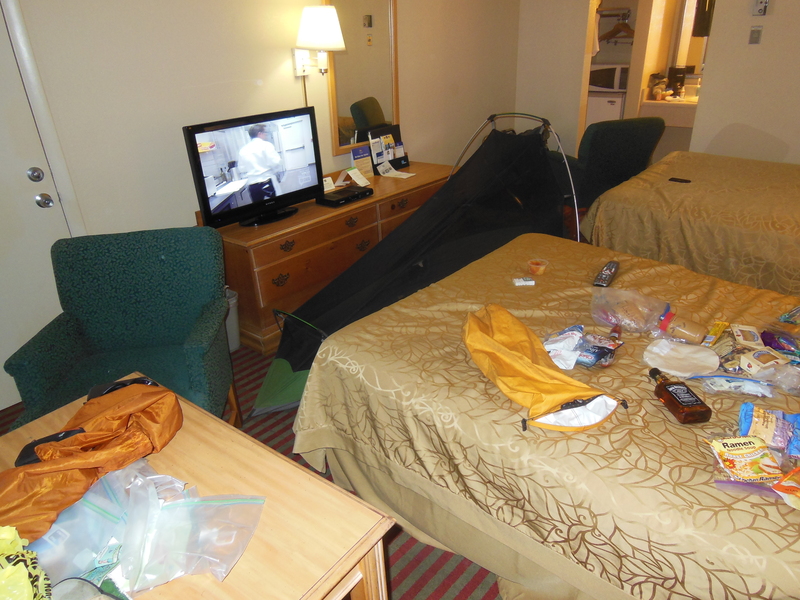 And lastly, as you can see on the bed in the picture, I got my first maildrop from home!! Everybody hooked me up with some good stuff, and Paul got me a couple awesome Mountain House meals. And… I got a nice little pint of whiskey! So that’s that! I’m about to head to the outfitter now. It’s getting a bit too hot for my +15 bag, so I’m thinking about making a purchase to deal with that (and hopefully cut down on some pack weight). Then, of course, I’m going to eat a bunch of food! The life of a hiker! These libraries in these towns are killing me! They really do make it difficult to upload images to WordPress. I can’t even find the actual computer at this place, all I see is the monitor! But enough of that – because I have reached Harper’s Ferry! Yes, the unofficial halfway point of my journey has been attained. 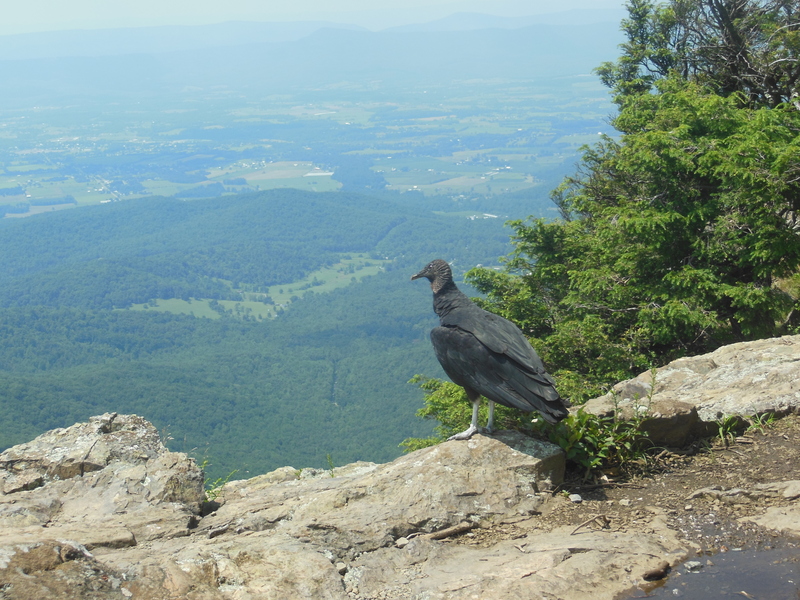 I went to the ATC today to register and get my picture taken, a must for any long distance hikers on the AT. All in all, it’s an awesome feeling to get here. As I was coming down into town yesterday, I thought back to when I started my trip, and how I had pictured reaching Harper’s Ferry. The way you picture things like that is never how it is in real life. I had imagined the trees lined in gold, the sun shining down on me, and me walking into town with a sturdy gait. However, reality would deal me a different card, as I clambered into town, rain dropping from the sky, fresh blisters hobbling my stride, and still another half mile to walk to my hostel (after spinning around in circles trying to find the blazes to follow). But although it wasn’t as I imagined, it was an awesome experience to reach this town. About a mile out of town, I sat and took a rest, overlooking the Chesapeake River. I recorded a little video of myself, and swigged down the last of the whiskey Paul sent me a ways back. Physically, I did not feel as I had hoped. But mentally, I never imagined feeling the way I do now. This journey all kind of felt like a dream before, kind of floating around in the back of my mind. But now, it feels real. I am starting to believe, and focus, on the end goal. Before reaching this town, all my thought was going into getting here. But now I’ve attained this milestone, so the focus will all shift to the terminus of the journey, Mount Katahdin. On the negative side, my buddy Colonel Patches hopped off the trail today after reaching Harper’s Ferry. 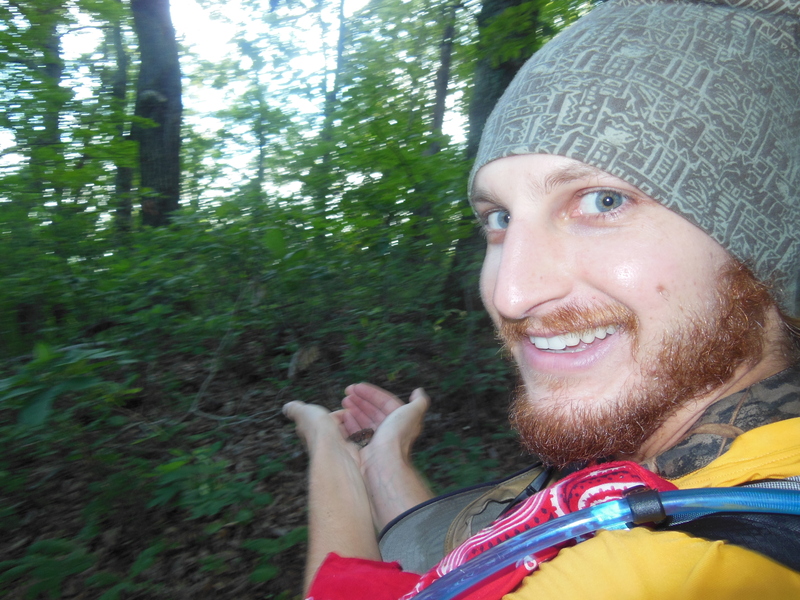 He is completing the trail in two large sections – the first bringing him from Georgia to Harper’s Ferry. I saw him just before he jumped on a train to DC, all snazzed up and wearing regular human clothes. It was kind of bizarre to see him in something other than the one shirt I’ve seen him in for the past few weeks. And I know it was even more bizarre for him to be leaving the trail and returning to real life after two and a half months of the hiker life. But he’ll be back out next summer to do the second half of his journey. So good work Colonel Patches (he’s on the left of the picture. Bud is the other dude). So now I’m just hanging in Harper’s Ferry. 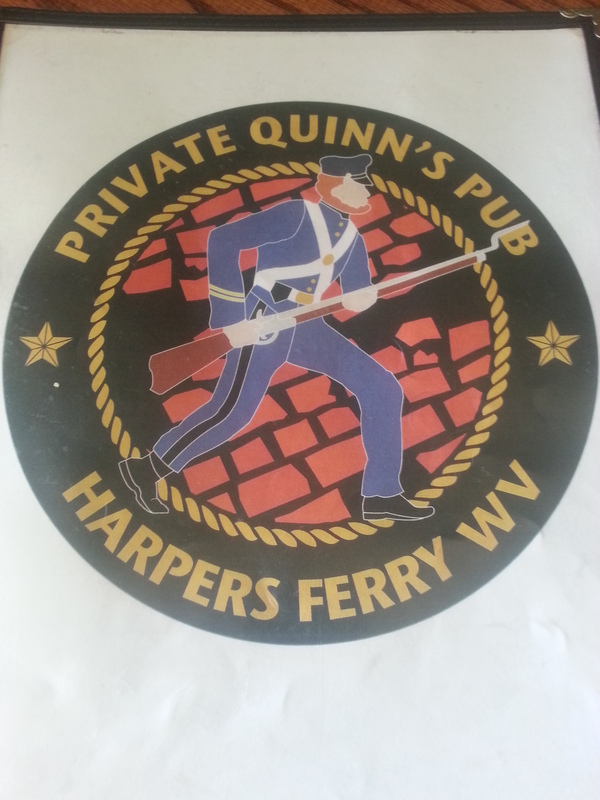 I had lunch today at Private Quinn’s Pub (good thing it’s not quinns privates or else it’d be too small for anyone to get into). So that was pretty awesome. I was really hoping for a free beer or something, but the bartender just told me she sees a lot of Quinns come through there. So apparently I wasn’t anything special, haha. But I got some cool shirts for the family, so it was a trip well worth it. This dude Bud took this neat picture a while back. We were just marveling at it today. So enjoy. I need to get out of this library soon since they’re closing down! They’re shooing me out the door right now. But I keep telling them that my fans in Russia need an update – they’re waiting on my update!!! As some of you may know, pretty much all the footwear I’ve worn for the past two years or so has been minimalist footwear. Even at the office, I wore zero dropped, wide toe-boxed shoes (they were somewhat goofy looking – people laughed at me regularly). So when I decided to do the trail, I of course had to stick to my new footwear philosophy, and continue the minimalist way. 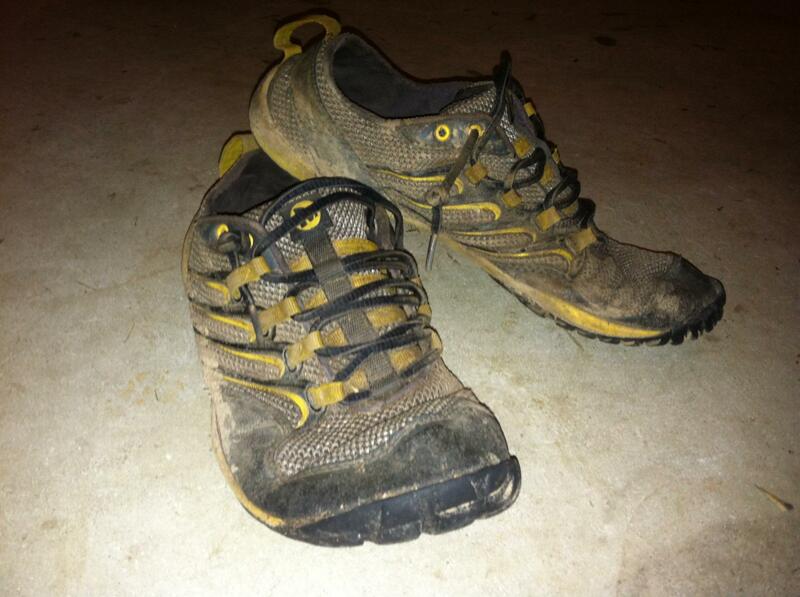 Amazingly, even with all those miles on them, they lasted until Pearisburg, Virginia, at about mile 700. I was very impressed they lasted that long. However, I had to turn them in for a couple of reasons. First, the sole just started to wear too thin. Even with a rockplate in the forefoot (the rockplate is just a 1mm piece of hard plastic), I was just feeling too much ground (I’ll explain this a little more later). 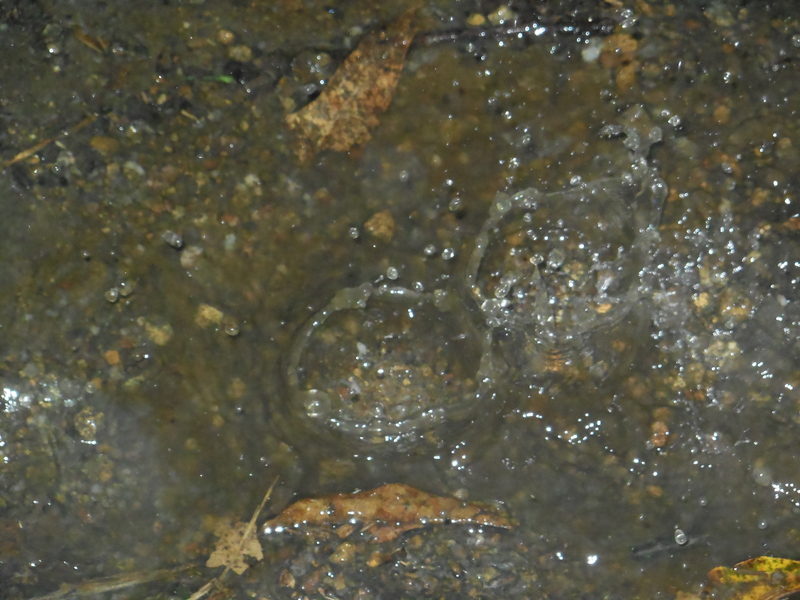 And secondly, the sole started to peel away from the upper at the toe, you can see it a bit in the picture above. That issue would result in me clipping the toe on rocks or roots, making me trip up a bit. Pretty amazingly, those are really the only two issues I had with the shoes. The uppers held up well. There was some slight wear at the heel on the inside of the shoe where the fabric tore away at the seam, but that was pretty minor. Color me impressed with the wear and tear these suckers can put up with. Sonice Gloves: My replacement shoes were another type of Merrell’s Barefoot series, the Sonic Glove. In effect, the Sonic Glove is the Trail Glove, but with a modified upper. Whereas the Trail Glove has a mesh upper, the Sonic Glove has a hard shell upper that is somewhat water resistant. For the AT, I think the Sonic Glove is a better fit. The slight waterproofing ability of the shell upper keeps your feet dry when you’re walking through dewey grass in the morning, or stepping through small puddles. However, it is nowhere near water proof, and the water resistance is minor. The shell upper also adds a bit more backbone to the overall shoe. This may be in my head, but I think I stubbed and hurt my toes more often with the Trail Glove than the Sonic Glove. I think the added structure that the shell affords may have something to do with that, but who knows. I haven’t a clue! I did make a modification to my Sonic Glove to take into account the peeling of the sole at the toe. In town a week or so ago, I got some super glue, and I glued all around the front of the toe, where the sole meets the upper. On top of that, I took some stuff called Tenacious Tape (it’s tent repair tape), and put a layer of that over the toe for added protection. So far it’s worked well. I need to replace the tape every week or so – but that’s not a big deal. What I Would Change: Thus far, I think I’m going to stick with the Merrell Barefoot series for the rest of the hike. There have been some times along the trail where I wished I had less ground feel however. Especially on very rocky portions, I want to take my shoes off and throw them, and just wear my cushy Crocs along the way! But that’s something you need to deal with when wearing minimalist footwear. So although it is frustrating sometimes, it’s the nature of the beast. There are a couple of things I would modify if I were some the footwear developer at Merrell… and I was making a hiking shoe. Because keep in mind, these shoes aren’t for hiking – they’re trail runners. So things like the intense ground feel are just what you need to put up with when wearing trail runners out here. 1) Thicker Rockplate – I’m no footwear expert, so this may be a rockplate issue, or it may be that the sole would need to be slightly thicker. I believe the soles are only 4mm thick on these shoes, and at the forefoot, there is a 1mm rockplate. Obviously, that is super super thin. And obviously, the ground feel is immense. That’s a good thing for what these shoes are. However, for hiking, I would prefer a little more protection. There are some days where rocks are just eating my feet for breakfast, so a little more thickness on the sole would be preffered. But again, this isn’t a knock on the shoe, it’s merely something that I would benefit from looking at it from a hiking standpoint. 2) Toe Bumper – There isn’t really a toe bumper on these shoes. It’s just the sole that comes up at the toe. It’s thin and flexible. Again, that’s fine. 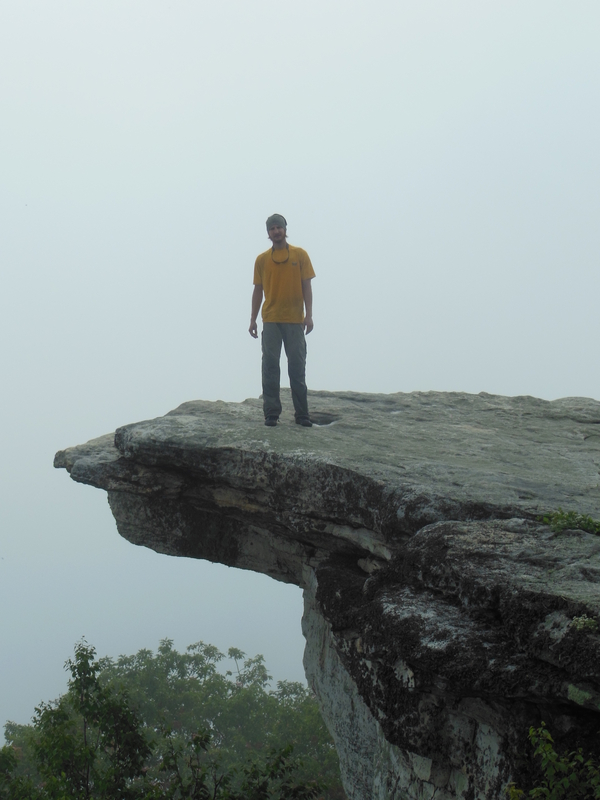 But on the AT, you jam your toes on all kinds of terrible things. So having a little more protection at the toe would be a plus. 3) Lacing System – These shoes have a pretty cool lacing system, but I honestly don’t use it. I don’t even lace them up as you can see in the pictures. I like the feel better without the restrictions of the lacing. So I would like a non-tying, adjustable system that allows for loose fitting closures. I have no idea how to do that, but that would be sweet. The RunAmocs have a pretty neat closure system. It’s literally just a lace that goes around your ankle. Very simple, but seems to work well. 4) Water Proof Upper – Water proofing may be too much, but they could use more water resistance. They are very slightly resistant, but more would be a big help. Dew and light wetness don’t get through, but a slight drizzle does on the current design. If it can be upped to resist a light rain and keep my feet dry, that would be huge! 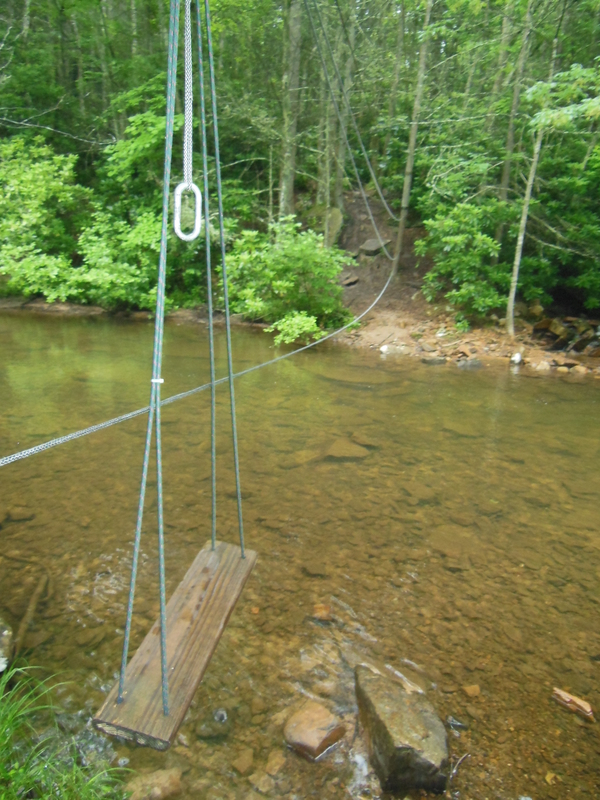 Because hiking in wet feet is a disaster – not fun at all. Overall: So Merrell, awesome job with these shoes. I love them, and the Barefoot series is what I’ve worn out of work for the past couple years. I prefer them over Five Fingers immensely. I’m hoping as I hit some rocky areas in PA and NJ, I can continue to deal with the ground feel issues I’ve had. I think I can, but I admit, there are some times where I get very frustrated (not with the shoes, but just at the general situation). But I have realized one thing – with minimalist ideals come great physical sacrifice! And Merrell, feel free to contact me, or simply hire me as a C Level executive specializing in minimalist footwear if you so please. I believe my mother would be very happy with that! (see Ma, I’m doing some job searching even when I’m on the trail). PS. I hope this post wasn’t too disjointed. I wrote it over several sittings, and had to post it finally – it was annoying me sitting in my drafts!